Sealaska Heritage Institute (SHI) has signed up nationally known educators to give keynote addresses at its first culturally-responsive education conference for educators in June. The event, Our Cultural Landscape: Culturally Responsive Education Conference, has drawn some of the best names in the field, including Zaretta Hammond, Dr. Christopher Blodgett, Ilarion (Larry) Merculieff and Libby Roderick. Hammond is a national education consultant and author of Culturally Responsive Teaching and the Brain: Promoting Authentic Engagement and Rigor for Culturally and Linguistically Diverse Students. She is a former English teacher and has been doing consulting and professional development around equity, literacy and culturally responsive teaching for the past 21 years. She has provided instructional support for a variety of organizations, such as Santa Barbara County Education Office, Sonoma County Office of Education, and Teaching for America. In addition, she has worked with leaders and teachers in school districts across the country. Blodgett is a Washington State University (WSU) faculty member and a licensed clinical psychologist. He has been the Principal Investigator for more than three dozen federal and national foundation grants addressing high-risk children and families. He is the Director of the CLEAR Trauma Center at WSU. Trauma-informed schools work in the CLEAR model now includes multiple schools in Washington, Oregon and California. Blodgett and his team partner with communities and systems to adapt the science of resilience, brain development, and trauma treatment to better address trauma resulting from childhood adversity. Now funded by multiple federal and philanthropic grants, this work documents the profound and immediate consequences of Adverse Childhood Experiences (ACEs) and tests practical actions to improve child, family, and system outcomes. Merculieff was born on the Pribilof Island of St. Paul, raised in a traditional Unangan (Aleut) community and given the traditional name Kuuyux by an Elder. At the age of four, he was chosen by the Elders to serve as a bridge between traditional Aleut culture and the outside world. He graduated from the University of Washington, having established the first indigenous student education program there. Merculieff has served Unangan and other indigenous peoples over a forty-year career devoted to the environment, human rights, community wellness, economic development and cultural enhancement. He has held leadership positions with a wide range of organizations, including the Aleut Corporation, the Alaska Inter-Tribal Council, the Alaska Native Science Commission and the Alaska Department of Commerce and Economic Development. Organizations he co-founded and/or co-directed include the Indigenous Peoples’ Council for Marine Mammals, the Alaska Oceans Network, the International Bering Sea Forum, the Bering Sea Council of Elders and the Science Working Group for Snowchange. He is presently the director of the Global Center for Indigenous Leadership and Lifeways. Roderick is Associate Director for the Center for Advancing Faculty Excellence at the University of Alaska Anchorage and director of its Difficult Dialogues Initiative. Libby conducts workshops for faculty in the United States and South Africa on engaging difficult dialogues in higher education and on adopting indigenous ways of teaching and learning in educational systems. A lifelong Alaskan with a degree from Yale University, she is the editor of Alaska Native Cultures and Issues: Responses to Frequently Asked Questions; associate editor of Start Talking: A Handbook for Engaging Difficult Dialogues in Higher Education; co-author of Stop Talking: Indigenous Ways of Teaching and Learning and Difficult Dialogues in Higher Education; editor of Toxic Friday: Resources for Addressing Faculty Bullying in Higher Education, and contributor to many other national publications. Libby is also an internationally award-winning singer/songwriter and recording artist and composer of the global healing anthem How Could Anyone. Her music has been featured on CBS 60 Minutes, CNN’s Anderson Cooper and in international media, and she has performed all over the U.S and in Canada. 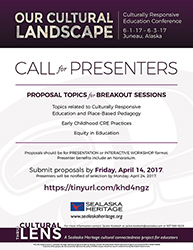 SHI currently is accepting proposals from presenters to speak at breakout sessions on 1). Culturally responsive education and place-based pedagogy; 2). Early childhood CRE practices; or 3). Equity in education. Benefits to presenters include an honorarium. Deadline to apply is April 14. The conference is scheduled June 1-3, 2017. Travel and lodging scholarships are available for educators at partner schools in Angoon, Hoonah and Hydaburg.